Oui oui oui... this painting is AVAILABLE for purchase... EMAIL me for details! Now be sure to visit other Outdoor Wednesday posts via A Southern Dreamer! P.S. I cannot friend people on Facebook... too many friends... soooo if you want to be my friend... LIKE me on My Fan Page... no limit on friends!!!! Love the painting Fifi. You did capture Paris across the Seine. Lovely. I have never been to France yet I think I know it through your excellent blogs. Thank you for taking me to Paris in one of my favourite times of the year...tres belle! 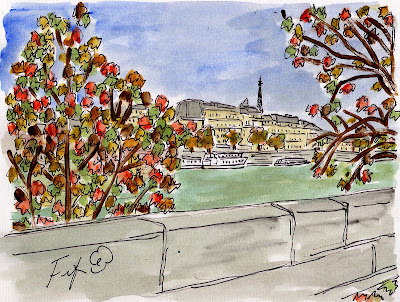 I think October and November-if it doesn't rain a lot-are the best times of all to be in Paris. A lovely painting, Fifi! Well done! Happy Blue Monday, Fifi! Check out my book giveaways.